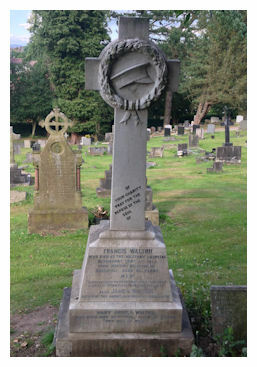 Frank - as he appears on his army records - was the first serviceman of the Great War to be buried in Macclesfield Cemetery. Born on Friday 25th January 1895, Frank was the youngest of James and (Mary) Angela Walton's three children: he was Baptised at St Alban's a few weeks later on Wednesday 13th February. The family lived at the no longer existing Bull and Gate public house at 32 Chestergate, where James was the landlord. Frank went to St Alban's school before moving on to Macclesfield Modern School, in Great Kings Street, at the age of eleven. He was at the Modern School when it amalgamated with Macclesfield Grammar School, in 1910. Frank was an athletic boy; he achieved success in his final year at school when he became the opening bowler for the school Cricket XI. On leaving school, at eighteen, Frank followed his brother James Jnr. to, what was then the heart of the country's bicycle making industry, Coventry. Frank went to work as a Correspondence Clerk at Edward O'Brien Ltd, known as "The World's Largest Cycle Dealer", where James Jnr. also worked. Less than a year after Frank started work, Britain declared war on Germany. On the day war was declared, Frank and James Jnr. were back home in Macclesfield visiting their family. They did not take long before deciding to enlist; Macclesfield Courier and Herald, of Saturday 26 September 1914, record the brothers as having volunteered for service during the previous week. Both brothers joined the 1/7th Cheshire Regiment, which was part of the Cheshire Brigade, Welsh Division. The Regiment was soon moved to Shrewsbury and Church Stretton. By May 1915, the Regiment was based in Bedford. It was from here that Frank began to send weekly letters to The Macclesfield Courier and Herald, under the name of "Peeping Tom", telling amusing stories about local Macclesfield lads who were in his Regiment. However, Frank did not have much time to write since in July 1915, the 53rd Welsh Division was told to prepare for service in the Mediterranean. Frank sailed from Devonport to Alexandria in Egypt. After only a few days, they travelled on to the Greek island of Lemnos. It was from here that Frank went on to take part of the Allied Forces' landing at Suvla Bay, on the Aegean Sea, with the goal of attacking German and Turkish forces on the Gallipoli Peninsula. On Tuesday 10 August, only one day after landing in Gallipoli, Frank was hit by shrapnel from a shell and suffered a fractured skull. Frank was immediately evacuated back to England. His parents received a telegram telling them he was in a "very serious condition" in hospital at Devonport. Unfortunately, when the telegram arrived his mother was in Ireland and his father in Bournemouth. Somehow the word reached James and he made his way to be at his son's side. 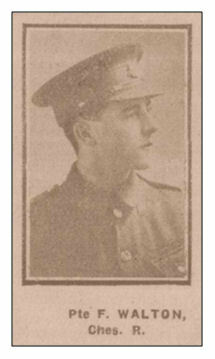 However, before his father arrived, on Sunday 5 September, Frank died of his wounds on Sunday 5 September. Frank died of his wounds on Sunday 5th September at the Military Hospital, Devonport. Three days later, Frank's body was returned to his family in Macclesfield. As the first soldier of the World War to be buried in the town, Frank's funeral attracted a lot of attention. The Macclesfield Courier and Herald reported that the Frank's funeral was "...the most impressive funeral to have been seen in Macclesfield for many years". Huge crowds lined the streets as the funeral cortege proceeded from the Drill Hall in Bridge Street to the Cemetery. People paying their respects lined the length of Chestergate and every house along the route of the funeral procession had its blinds drawn; even the town's licensed houses closed their doors. With due solemnity, a total of eighty members of the Frank's regiment, the 7th Cheshire Regiment, followed behind the gun-carriage carrying Frank's coffin, which was draped with the Union Flag. The atmospheric Second Movement of Beethoven's Symphony No.3, "Marcia Funebre - Adagio assai", a funeral march in C minor, was played by the Borough Reed Band and the Town Silver Band as the funeral procession progressed. In keeping with a funeral awarded full military honours, when Frank was laid to rest, a firing party of twelve servicemen, sent from the 2/7 Battalion at Oswestry, flanking the graveside, fired three volleys. This was followed by a bugler sounding the Last Post. 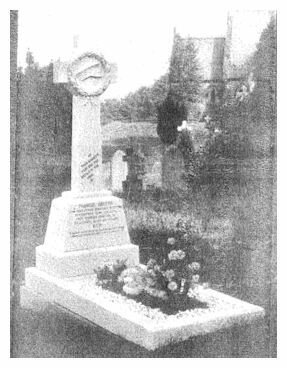 "Of your charity pray for the repose of the soul of"
An early photograph of Frank's grave (see below on the left), lent by Frank's nephew, John Walton, shows the grave originally had a marble surround, which contained marble chips and a space for flowers. The surround and marble chips no longer exist. This may be because the grave was later opened for the burial of both Frank's father and mother. 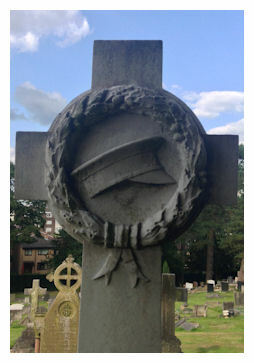 James Jnr., who enlisted alongside Frank, survived the war. He caught dysentery in the trenches at Suvla Bay and was on a hospital ship at the time of his brother's funeral. He was indeed lucky to be alive since his regimental badge saved him, when it deflected a bullet to hit his shoulder, when serving in Gallipoli.